Hooray for the holidays and finding just the perfect gift for that writer in your life whom you love so much. 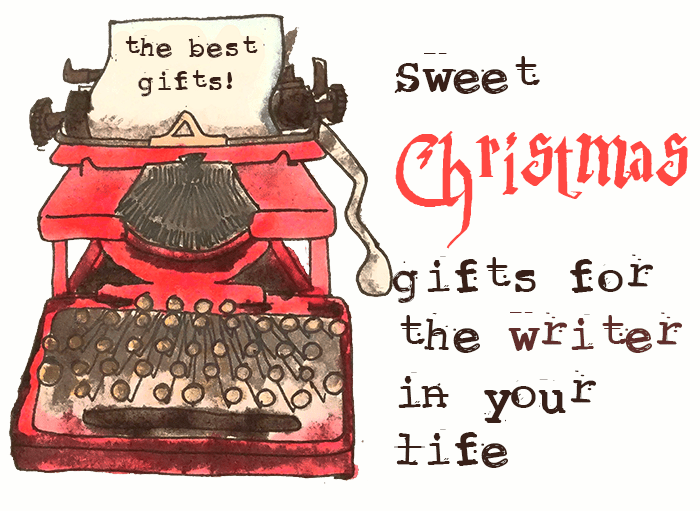 Here are some sweet gifts you can get them because that incredible, antique typewriter is crazy expensive and who can find one of those at a pawn shop anyway?! A sweet typewriter t-shirt: What better way to tell the writer in your life of your undying devotion to them than by spelling it out on a sweet, old typewriter? Yes! They’re just your type. They’ll love it. And Woot! does a great job of putting out quality t-shirts as well so you’ll be happy with the fit, too. Feel free to buy a whole slew of t-shirts. Dress the entire family in them. When the kids get to match with mom and dad, everyone wins. Woot woot! While you’re on their site, browse the other shirt designs as well. Woot does an awesome job of gathering work from lots of independent artists so when you buy from there, you’re supporting an individual’s creative work. That’s pretty rad in my book. Document scanner: writers may not WANT to stay organized, but keeping on top of work and taxes and doodling to go with their creative posts would be much easier with a highly rated scanner. I like (and want, hint hint) this one. Some people have scanners through their all-in-one printer and that will do the trick for scanning receipts or a signed contract, but it can’t cut the mustard for scanning in artwork. I like to draw something to go with posts on my personal blog and until I have this printer, my clunky workaround is to use my phone and then open the picture in Photoshop. Like I said: clunky. Jeff Herman’s Guide to Book Publishers, Editors and Literary Agents 2017: Who They Are, What They Want, How to Win Them Over. This book wins as the best guide for getting published and all writers desire the covetous publishing contract. Even the published writers are looking for improving their publishing game! Okay. Unless it’s Rowling. She’s probably in good shape. Last I checked, though, Rowlings are far and few between so guides like this are fabulous additions to a writer’s library. The Art of Memoir. I would put this one near the top of my personal list because I’ve been working on my own memoir for the last two years. This book is an excellent guide from both Karr’s experience writing her own memoirs to other authors whose experiences she includes in this book. Plus, in the end, it will remind you: your story is worth telling. All the Light We Cannot See. Some books don’t live up to the hype. They’re on the bestselling list because a celebrity wrote them, or perhaps a 15-minutes-of-fame-youtube celebrity. Or there’s some sappy ooey gooey going on that some book clubs have jumped on. Not this one. This one is a NYTimes bestseller, yes. And, this one is the real deal. I used to be in a book club with coworkers, several of them professional writers. They often shot down the latest and greatest crazes, but this book was highly enjoyed. It’s a lyrical beauty. Your Brain at Work: Strategies for Overcoming Distraction, Regaining Focus, and Working Smarter All Day Long. If you’ve talked much with the writer in your life, you’ll know that the evil hand of distraction is constantly looming over their daily word-count goals! That’s why this book is such a gem. Wouldn’t you love to understand the science behind why your brain works better under certain circumstances than others? Brains are fascinating. David Rock has the experts tell you how they work. The Well-Educated Mind: A Guide to the Classical Education You Never Had. Not all writers come from a renowned MFA program! Take me for example: my master’s degree is in technical writing. Boy, let me tell YOU: I can whip out a riveting user manual, yo. When I purchased my copy of this book, it was a few years ago, but from its pages, I got to relive some of the brain-churning challenges of my bachelor’s in English. This version is updated and expanded. That’s cool. You’ll find a reading program outlined in this book, but it’s a program set up more like a study of the masters that you might have gone through in an MFA degree. To be honest, I don’t know for sure because I don’t have one, but I have a good feeling about the things I learn from this book. It’s a brilliant guide. A beautiful dot journal from the classic Moleskine. But, why a Moleskine? What’s all the hype about? Here’s my brief list about why (based on personal experience, of course): Durable (two of mine are now 17-years old and well loved); they treasured and therefore used; they feel amazing as you hold them in your hand; they have many styles and options to find your perfect match. Your writer will love you for buying them such a treasured gift. Pens!!! No writer wants to be without a pen and it doesn’t have to be fancy. Seriously. One of the favorites of many writers (according to some website I found once years ago so trust my memory on this one, people) is the Pilot G2. So stock up with a whole slew of black, blue, and red pens. You’ll get a big hug for this gift. Really big. An antique typewriter. Oh my wool socks, I would give up so much to get my hands on my very own truly genuine beautiful piece of work in the form of an antique typewriter! Seriously. One day, I hope I am able to add one to my life. Until that day comes, perhaps this pencil holder would be nice next to my monitor. I mean, it is pretty adorable.